When it comes to making money in a recession, understand two things; it can be done and flexibility. For the past two decades, especially the 90’s and the tech boom, it was common to see a stock double or even triple within a short period. There was no major statistical analysis, throw the darts and roll the dice. Things have changed, the pendulum has swung. Our market is not producing the same results, yet we still want our portfolios to increase 10-12% a year. Obviously in a recession that is not going to happen, but our portfolios do not have to be down 40% either. A close confidant of mine with Morgan Stanley has focused on taking advantage of the swings in the market by utilizing leveraged ETFs. The ideology is simple, but the need for flexibility is great. Two ETFs to keep in mind are Direxion 3x FAS and BGU. Both are bullish Financials and Large Cap respectively. But you need to understand exactly how ETFs work. 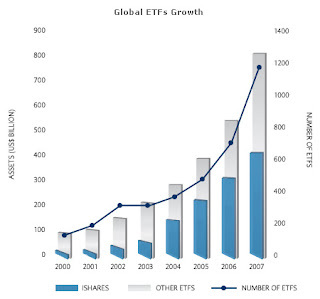 ETFs can be traded just as easily as any other stock. All you need is a brokerage account. Zecco.com has some of the best rates around. They have the diversification of a mutual fund but trade like a stock. The attraction recently to ETFs is their ability to take advantage of volatility, much like an option, but without the hassle of understanding calls and puts. But remember an ETFs whole goal is simply to outperform their respective sector each day, not over a long term basis. When an ETF claims to “double the DOW”, their time horizon is today, not tomorrow. Do not believe if over a five year period the DOW gained 10% that your return should be 20%, it does not work that way. An ETF uses options, derivatives and other investing strategies to inflate their returns. They have to. They could not produce “double” returns without such risk. Plainly stated, ETFs and especially leveraged ETFs are derivatives made simple for the common investor. They have the potential of bottoming out, but with control risk you can take advantage of the upside while limiting your downside. This is where the flexibility comes. If you take 10-15% of your portfolio and buy an ETF, place a stop order 20% below your purchase price. This allows you some volatility without losing the entire value. For example, you bought FAS and out the gate the Financials are getting hammered, the ETF will drop, but maybe only 16-17%. During the afternoon, the Financials rebound and all of a sudden the ETF is up 9%. You made good money, with down side protection. But let’s say the Financials continue to get hammered, the ETF drops 25%, your stop order triggers and you lose 20%. It stings, but 20% of 10% of your total portfolio isn’t too bad. Allow yourself some volatility, do not put a stop order for 1% below your purchase price, let it play out. We all know emotion is driving the market, an ETF is susceptible as anything else. It’s amazing to me how much power the talking heads have on the market, don’t get caught up in what they say, look deeper into the sector you’re investing in. Break the mold. This may not be your flavor, but it’s one idea that has worked. This is not a long term play; this is a day trade maneuver. There are a number of ETFs that hit on just about every sector of the market; find one and follow the sector for a few weeks. When the market is so inconsistent, taking a protected risk can have huge payouts. This is what “smart money” is doing, think about it. I have not given up the crash market mentality...not at all (did your read my post yesterday?)... I actually think the rally is dying and soon the deflation will kick in, in my opinion. I say this with a lot of affection towards your site, but I'm not overly impressed with Chad's posts so far. A lot of his stuff seems like it's straight out of a textbook and I don't know how much time he's taken to really read your stuff and understand your target audience. Honestly, how many people here don't know what leveraged ETFs and FAS and BGU are? And there are the little patronizing things he says like "think about it" or that "Rays vs. Pinstripes" post which just rambled on and on without really saying anything. Don't get me wrong: I get the impression that Chad is a nice, knowledgeable guy and that he seems to have a genuine desire to help people - I just see him as more of a talker than a listener and see his posts has having more style than substance. I don't like to criticize and hesitated before posting this, but I'm saying this in the spirit of constructive criticism and because I'd want to be told the same thing. P.S. I'm not necessary saying that I want someone who shares the same opinions as you do, but rather a post written in a non-patronizing tone that's written by someone who's actually taken the time to read every single post you've written, understand your target audience, and relate to his/her readers the way you do: as an intelligent person with genuine strengths and weaknesses who really respects their readers (and their intelligence) and imparts your experiences and knowledge as a real person. I guess I've really gotten used to your writing style and am now a bit spoiled. I half expected to see Chad's post after friday's rally. With this market rally lasting longer than most would expect, u got to have a bullish economist on board like Chad to give the bullish crowd a pat on their backs. On some profit-taking days when market dips in this sustained bear (even if it is) rally, FF comes out with post to reassure the ones who have been shorting. Flawless plan. Perhaps if the bulls convincingly take over, dear Chad can start a $20/mth podcast. And maybe next, FF can get a market-neutral strategist on board to give this site more style. If you are sometimes too busy to post a blog, just skip the day. Chad's postings are boring and not worth reading to me. I feel they rather hurt your site than they do any good. I agree with the others....Chad's posts have nothing to offer....its just a waste of time. FF, what do you think of this article touting Simon Properties as the great consolidator by buying the secured tranches in distressed REITS? The recent rally in shares of real estate investment trusts has amplified the disconnect between equity- and debt-market valuations in the sector, which has in turn opened back-door merger-and-acquisition opportunities to the more well-capitalized players in the space. REIT shares have rallied between 30% and 60% over the last month despite continued weak retail sales, rising vacancies, structural overcapacity in the sector, staggering debt loads and significant refinancing risk at some of these companies. Consider the debt/market equity ratios of these REITs, whose shares have more than doubled from recent lows: CBL & Associates Properties Inc. (CBL), 18.3x; Developers Diversified Realty Corp. (DDR), 13.3x; Macerich Co. (MAC), 5.5x; Duke Realty Corp. (DRE), 3.1x. In addition to high debt loads, each of these companies also faces significant, near-term refinancing risks with anywhere between 40% and 60% of their debt maturing within the next three years. Understandably, therefore, the enthusiasm of the equity markets hasn't been shared by the debt markets. The pricing of credit default swaps, which insure against the default of a company's underlying bonds, have remained at elevated levels for most REITs, with bonds of these companies continuing to trade at significant discounts to face value (for example, Developers Diversified Realty's 3.75% October 2012 senior bonds are currently trading around 44% of face value). This obvious disconnect between the equity and debt markets presents a lucrative opportunity for large, diversified companies in the sector with strong balance sheets to consolidate their weaker counterparts. Leading REITs such as Simon Property Group Inc. (SPG), Public Storage (PSA) and Vornado Realty Trust (VNO) can acquire the senior secured debt, or the mortgage notes securing assets, of their weaker competitors at their current discounted prices and then simply wait for these companies to sink under the weight of their own debt. This could prove a unique win-win strategy for well-capitalized companies looking to acquire others. If the target company does default, it would give the acquirer a strong negotiating position and make it the leading contender to take possession of the assets of the defaulting company. The worst that would happen is that the target company would actually make good on its obligations, providing a handsome return to the investor. The bottom line is that there are more than 130 publicly-listed REITs in the U.S., many of which are unlikely to survive, given accelerating deterioration in commercial property fundamentals, increasing funding costs, higher capitalization rates and a tough refinancing environment. This was recently reflected in the bankruptcy filing of General Growth Properties, which was unable to refinance its principal loans and mortgages as banks and other financing sources reduced their appetite for such loans. So far, this strategy has been successfully executed by few companies. One example, albeit in a different sector, is American Greetings Corp.'s (AM) recent acquisition of Recycled Paper Greetings. American Greetings bought a sizable chunk of Recycled Paper's debt in July 2008. After Recycled Paper defaulted, American Greetings bought it out in a prepackaged Chapter 11 reorganization transaction earlier this year. Given the increasing chatter about consolidation among REITs, the potential consolidators in the sector would do well to take a page out of American Greetings' play book and draw up a list of weaker competitors whose debt they can acquire on the cheap without having to pay full price for the equity of these companies. FF will look silly with continuous bearish posts in the short term if market continues to rally. And if the crash doesn't materialize and this turns out to be the start of the next bull market with everyone here missing the boat, FF will have eggs all over his face. That's why he needs Chad here. Funny how when the market is tanking as FF predicted everyone worship him as a guru, and now that the market is nosing up for a bit people start to call FF a charlatan. I think FF's posts are very thoughtful, and will prove to be prophetic a couple of months from now, so keep up the good work. That being said, I have to say that Chad's posts are no where near the quality of FF's. As someone commented earlier, Chad should really get to know his target audience. We come here to read market trend analysis and commentaries. Think about it. And even more so silly will your comment look if the market does go down again. I have not been trading strong short towards the end of this recent rally, I have been sitting, preserving my capital and waiting until the time is right. I have done just that. As for Chad's post, they are his thoughts and perceptions of the market. We obviously have different writing styles and may differ in opinion of market trends and analysis. I think many have mis-interpreted his position in the market place. I have asked him to bring more insider knowledge to the greed of wall street, as he has seen it from first hand. If his writings are not your cup of tea...skip over him. We can differ in belief and maintain respect. Bushindo, thanks for the respect...I have not departed from original belief. I respectfully submit that Chad should read every single post you've ever written and understand your target audience, then write stuff that caters to the intelligence level and knowledge of that target audience, regardless of whether his beliefs are in sync with yours or not. Hopes Fulfilled - Recession Over?